Friday was a bittersweet day for me as it was essentially my final day at Trinity High School. You may know that I live in Dracut, MA and while I don't mind the commute (about 30 miles one-way), with four young children and many night and weekend events, it was getting harder and harder. I was not looking forward to leaving Trinity but an opportunity opened up to teach religion at Central Catholic High School in Lawrence, MA and I accepted the offer last month. Central is about 11 miles one-way from my house and is just two towns away. In addition to be being closer to home, I will finally have the same February and April vacations as my children! Mr. Mailloux '72 and Mr. Gadecki could not have been more supportive with my decision and made this transition incredibly easy. We agreed that I would work this week as Central doesn't start for a couple of more weeks. I offered to open up the year and all the opening year events and will close out my Trinity career this Monday at our freshman retreat. I am happy to say that we've hired a wonderful new Director of Campus Ministry - Ms. Julia Kepler. Ms. Kepler comes to us from the New England Classical Academy in Claremont. She is a graduate of Mount Royal Academy in Sunapee and Belmont Abbey College in North Carolina, a Benedictine college. I met Ms. Kepler this past Wednesday and we had a few hours to chat and go over the campus ministry program. I am confident that she will bring fresh energy and ideas to Trinity High School while maintaining our great customs and traditions. She doesn't start until Sept. 6 but she will be at the freshman retreat on Monday. I will hand over the keys to the kingdom - and the password to this blog - on Monday. Mr. Maurier '72 and Mrs. Trachim P'08, '10 invited me to attend yesterday's choir practice given my long association with the choir, both as a former member and in campus ministry. Afterwards I went up to thank them and Mr. Maurier said he wasn't good at goodbyes. I said I wasn't either and our eyes both welled up, it was pretty emotional. Thank you. Thank you for all of your support of our efforts and for your commitment and dedication to our Catholic mission and identity. I am sorry that I won't see our Lasallian affiliation all the way through but I know that it will transform our school. I am proud of many things but the Lasallian affiliation is perhaps my proudest. I will miss all of you terribly but know that I will forever be a Pioneer. Each year, freshman from Saint Anselm College fan out across the Manchester area to perform a few hours of service as they get to learn their new home. For the past couple of years, a group has come to Trinity High School and yesterday we were glad to welcome them. The students arrived around 1:30pm and we spent time in Campus Ministry before getting to work. I told them that as a small school, having a group like them come help us with little things goes such a long way. We don't have a big staff and only one full-time facilities man so their presence and assistance is very much welcomed. I also explained that I am leaving Trinity High School and I wanted to get as much done in advance for my successor so they would be a big help with that too. After introductions, we got down to work. I had them assemble the boxes for our September food drive and then drop them off in classrooms, collect and dump all of the recycling from the classrooms, throw away the broken coffee tables in campus ministry as well as an old (and BIG) file cabinet from the stage, count some American flags for our Sept. 11 commemoration, and then help Mr. Poisson move some supplies. Following this, we all gathered in the chapel (which is much cooler than the sauna we call campus ministry) for reflections and final thoughts. For me, it was quite fitting that one of my final "acts" at Trinity was working with a group of students from my alma mater (Class of 1998). Manchester has been my home away from home for 14 years - four years at St. A's and these past ten at Trinity. To have those two places come together on my final full day in Manchester was quite emotional and proof that the good Lord knows how to send you out on a high note! Yesterday, the first day of classes, all of the fall athletes and coaches gathered in the gym after school for a brief prayer service. I mentioned how gatherings like this are a reminder that our Catholic faith and our Catholic identity permeates everything that we do, not just in theology classes or campus ministry. We began with a brief Liturgy of the Word where students proclaimed readings and a psalm refrain followed by a reflection by me (see below). I then called up all of the coaches and presented the head coaches with an icon of St. John Baptist de la Salle, a medal of the Guardian Angel to all coaches and asst. coaches, and a prayer book to the new coaches. We then offered a prayer for the coaches and then the athletes followed by us together praying the Lord's Prayer. Mr. Polak, our athletic director, then offered his customary speech on sportsmanship. Best of luck to all of our student-athletes this fall! Go Pioneers! Take a moment to look around at the banners in this gym. The long, thin banners list all of the Catholic high schools that existed in Manchester and the bigger banners over near the exits list all of the championships our schools have won over the years. Take a moment to soak in the history and legacies that have come before us. 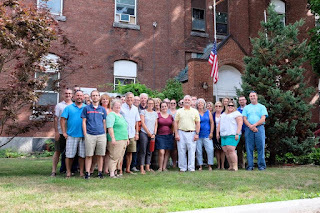 On Monday, the faculty and staff of Trinity High School began the academic year with a retreat over at St. Joseph Cathedral here in Manchester. We then walked down to the original Catholic high school here in Manchester, St. Joseph’s High School for Boys which was located across the street from the Red Arrow. This school opened 130 years ago this fall and existed until 1951 when the school moved here and was named Bishop Bradley High School. In 1970, Bishop Bradley merged with St. Anthony’s and Immaculata High Schools to create Trinity High School. It was incredibly powerful for me (and I hope the other teachers) to stand on the same ground as the Pioneers of Catholic schools here in Manchester. You and I are the standard bearers of their work and continue to carry on the long traditions of those who came before us. When St. Joseph’s was open, the team name was the “Giant Killers” as the school routinely defeated bigger schools in sports. When Bradley opened the name was changed to the Pioneers to honor the many people who were Pioneers in Catholic education in Manchester. You as student-athletes here at Trinity High School have an enormous amount of history and legacies to build upon. I encourage you over the course of this fall to create your own histories and to leave legacies for the future members of the soccer, football, volleyball, cheer, and cross country teams. Be Pioneers. In just a moment, Mr. Mailloux will present each head coach with an icon of St. John Baptist de la Salle. May they be permanent reminders to our coaches of the powerful vocation they have to form our athletes into young men and women of faith, scholarship, and character. In return, may our athletes let their light shine on the court, the ice, and the track this winter and help bring glory to God...and the Pioneers! May God the Father bless our coaches and players this winter season, as they look to imitate God the Son, all with the help and guidance of God the Holy Spirit. Amen. 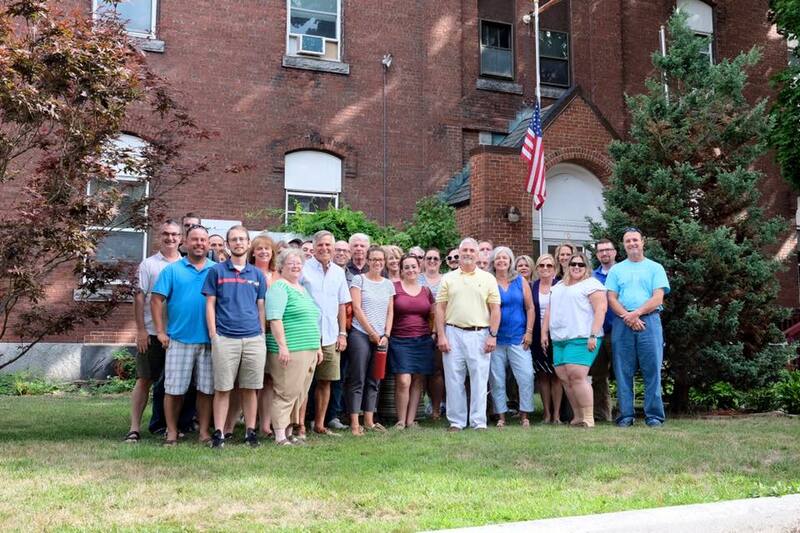 This past Monday, the faculty and staff of Trinity High School returned for another academic year! As is our custom, we began our time with a faculty retreat and we changed things up a little bit this year. As we continue with our reaffiliation with the Lasallian Christian Brothers, we thought it would be interesting to gather at the place where it all began - Saint Joseph's Cathedral. The cathedral predates the Diocese of Manchester (it was built in 1869 as a church, Manchester became a diocese in 1884) and when our diocese was created, St. Joseph's became the cathedral. The first bishop of Manchester was Bishop Denis Bradley and it was he who invited the Christian Brothers to come to Manchester to staff the new St. Joseph's High School for Boys on Lowell Street, about a 5 minute walk from the cathedral. Our gathering began at 8:45am with coffee and pastries in the basement of the cathedral. Our principal Mr. Mailloux '72 welcomed everyone and our former campus minster and current administrator of the cathedral, Fr. Andrew Nelson, offered an opening prayer. From here, we walked down to the old high school which opened 130 years ago this fall. That first class had 14 students and there were 5 Christian Brothers who taught there. The first principal was a Bro. Thomas (I cannot find his last name anywhere) and by all accounts he was an amazing principal and model. He was only principal for three years as he died of a heart attack. We didn't go inside the school as it is presently a recovery house so we just gathered on the front lawn and I gave some of the history of the school. Mr. Mailloux then read an editorial that was in the local paper in 1936 on the occasion of the school's golden jubilee. After, we walked back to the cathedral and we were greeted by Barb Miles, the archivast for the diocese who gave the teachers a tour. We also all walked through the Holty Door for the Year of Mercy and then got a history lesson on the stained glass windows, the altar, some of the sacred items that Bishop Bradley had commissioned such as a chalice, and the Blessed Sacrament Chapel. Barb told a wonderful story about Cardinal Lacroix '75 who visited the cathedral earlier this summer and showed Barb where he prayed everyday on his way home from Trinity to discern his vocation. The candles for the anniversary folks had the Lasallian quote of "Miracles Happen by Touching Hearts" where the new staff candles said "God Has Chosen You to Do His Work." Mrs. Hendriksen gave me a hug and I immediately forgave her for giving me a detention for “breaking china” (dropping the top of our desk) and for the 13 I got on one of her science tests! As I was driving home, I could not help but think back to my elementary school years and I began listing all of my teachers in my head. I can remember every single teacher I had as I am sure you can as well. We don’t always see the impact we make on our students nor do we think about the influence we have over them. But we can be assured that just as we remember all of our teachers, all of our students remember us. As St. John Baptist de la Salle points out in today’s reading, we as Catholic school teachers, however, have a responsibility to be more than just remembered by our students. We are not just teachers of math, science, English, world language, social studies, fine arts, and theology. Rather, we ambassadors for Jesus Christ and we represent Him for our students. For many of our students, Trinity High School will be the first and/or the last experience of the Catholic faith. We have four short years to not just help them get into college...but also into heaven. Conversely, de la Salle also tells us that our students are our salvation. That is, it is through our work in Catholic education, in this tiny corner of His vineyard that we find our redemption. As we begin anew, and carry on that legacy that began on Lowell Street 130 years ago, let us ask God the Father to bless our work, as we seek to imitate God the Son, all with the help and guidance of God the Holy Spirit. Amen. 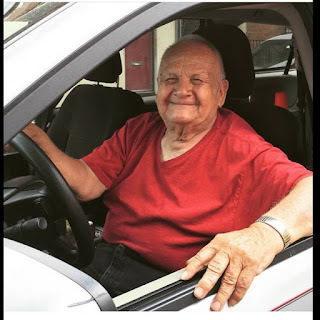 Faithful readers of this blog know how much I admire the people who live and work at St. Francis Inn in Philadelphia. These friars, women religious, and lay people have literally given everything to minister to the poor and my heart is always so full when I spend time in their midst. One of the more legendary people there is Bro. Xavier de la Huerta, OFM. Bro. Xavier is a friar and if you mistook him for one of the homeless or impoverished, you would be forgiven as he dresses very simply. One of his famous t-shirts is one that says "Jesus is my homeboy." Bro. Xavier is adored by the people of the neighborhood and more people ask to see him than any other person there. I have heard many a Trinity High School girl squeal when they talk about him, saying how cute and adorable he is! He is the epitome of humility and is the closest person to a saint that I have even met. His main job at the inn is to work at the thrift shop they run but he also gives rides to people who don't have cars and he hands out tokens for the subway. He collects bottles and cans to pay for the tokens. A few years ago when we were working there, one of our students had to leave early and I was driving him to the airport. Before he left, one of the lay volunteers came over to the house to say goodbye to him and the student handed him all the money he had left (about $30-40). He asked her to give the money to Bro. Xavier for his token fund. I was floored but not surprised and this remains one of my fondest memories of Trinity High School. I say all this because St. Francis Inn posted on Facebook yesterday that Bro. Xavier suffered a stroke yesterday at the friary and had emergency brain surgery. But, thanks be to God, the surgery was successful and Bro. Xavier will recover. It's funny, I was thinking of him the other day and was wondering how much longer he could give of himself as he is almost 80. I, like so many others, love Bro. Xavier and his witness. Please continue to pray for him and the people he serves. He is a true disciple of Christ and people need him (and Him) more than ever. One of my favorite churches is the Saint Anselm Abbey Church. 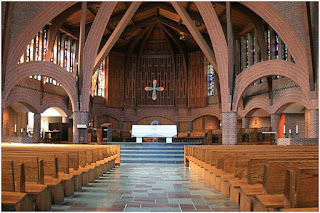 The church is unique in many ways, namely that it is round, has 16 arched beams, and doesn't have a lot of the features found in churches like statues or Stations of the Cross. But, it is an amazing temple of prayer and I spent countless hours in that church when I was a student there attending Mass and Vespers (Evening Prayer). There is a certain smell to the church and whenever I walk in, I feel right at home. The Abbey Church was dedicated on July 11, 1966 and this past week, the monks of Saint Anselm Abbey marked the golden anniversary. The idea for the church came from the former archbishop of Boston, Cardinal Richard Cushing who said the campus didn't have a "heart" when he was speaking at the installation of Abbot Gerald McCarthy, OSB in 1963. He then pledged $500,000 towards the building of a new church! One of the monks joked with me that the Archdiocese of Boston must still be paying that off! Trinity High School has a special connection to the church as we of course have our annual Baccalaureate Mass there and many of our faculty and staff are alums of the college. 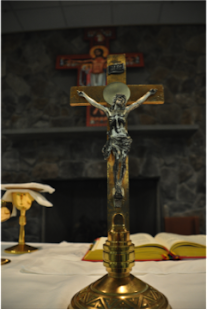 If you're interested, you can read Abbot Mark Cooper's homily at the anniversary Mass here. Welcome! This is the place for all the news, information, stories, and happenings in Campus Ministry. Campus Ministry is the heartbeat of Trinity High School and is the office through which our Catholic mission flows. Everyone - students, faculty, staff, parents, family members - is invited to be a part of the exciting work and mission of Campus Ministry.